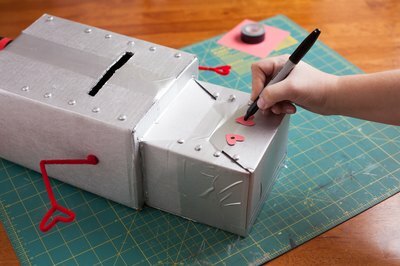 On Valentine's Day, help kids store their cards and notes in a charming robot box. With easy-to-follow steps, this robot is a perfect project for you to do with your kids. 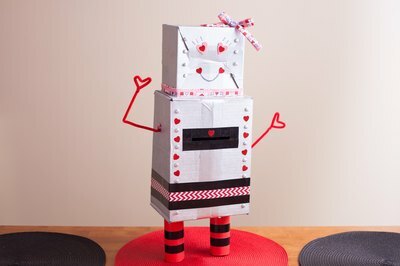 But what does a robot have to do with this day of love, you ask? All we know is that this adorable DIY will steal everyone's heart. A Valentine's Day Robot never disappoints. Decide where you want to put the slot-shaped opening. The slot could be on the top of the smaller box, the "head," or on the larger box where the robot's "chest" will be. 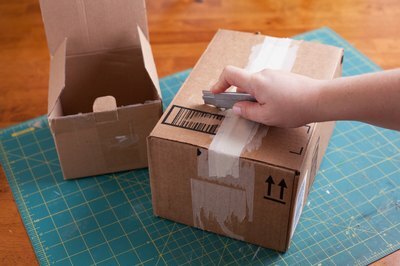 Use scissors or a box cutter to make the cut. This is where kids will put their Valentine's Day cards. Cut a slot in the larger box for cards. Glue the smaller box on top of the larger box. Now the head and body are attached. Tape the two boxes together to create the body. Attach the metal paper fasteners. Add four on each side of the robot's "face" all in a row. Add six down the front of the larger box. These will be the "bolts" on the robot. Give the robot character with metal "bolts." Paint the two boxes silver and let them dry. 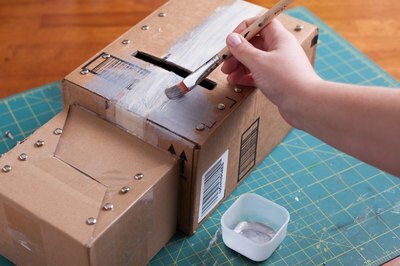 Depending on your paint and any markings on your boxes, you may need two coats. Paint as many coats as you need to cover up any markings. 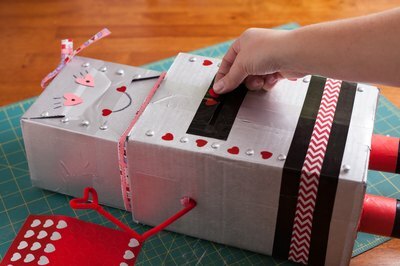 While your boxes are drying, use the construction paper to cut out hearts or other decorations that you'd like to add to the robot. Cut out designs of your choice. Hearts are always a good call. Make the robot’s legs. Cut a paper towel or toilet paper roll in half, which one you use will depend on how big your robot is. Wrap each half in washi or electrical tape. The legs could be either a solid color, or try using different colors to give it a striped look. Wrap the legs in tape. 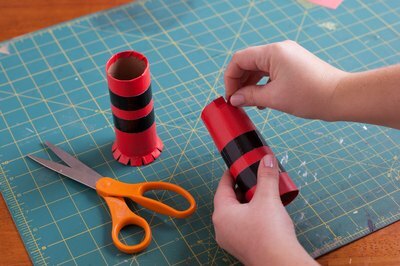 To make the legs easier to attach, cut one end of the roll into four small tabs. 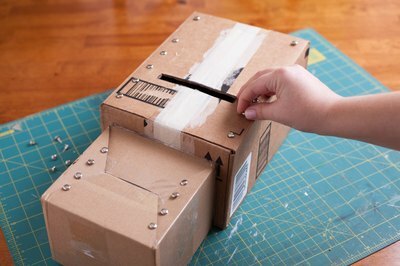 Bend back the tabs and glue or tape the legs to the bottom of the larger box. Making tabs will help glue the legs to the larger box. 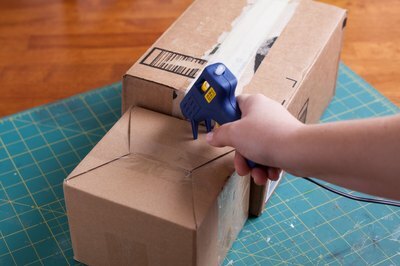 Glue or tape a pipe cleaner to each side of the larger box. Now you have arms! Pipe cleaners make the perfect arms. 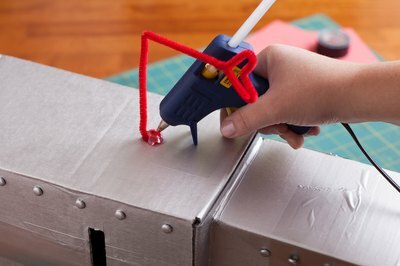 Draw a face on your robot with a permanent marker, or use the construction paper to make a face. Draw in your robot's face with marker. Decorate the robot. Add hearts, stickers or any other embellishments. Write your child's name on the back of the robot for personalization. Decorate to your heart's delight.